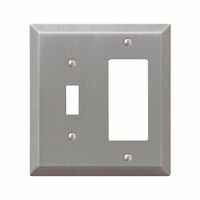 Amerelle Wall Plate, 1-Rocker, 1-Toggle, Series: Century, 4-15/16 in Length, 4-9/16 in Width, 2 Gangs, Stamped Steel, Brushed Nickel, Screw Mounting, Includes: Matching Screws, UL Listed Made from stamped steel. - 1 toggle, 1 decorator wallplate. With screws. 5" height x 4-5/8" width x 1/4" depth. Made from stamped steel. - 1 toggle, 1 decorator wallplate.